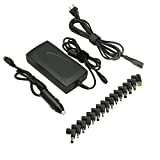 This Laptop Charger works with most laptops ultrabooks chromebooks, safety and stability, easy to use. You can power your different brand notebooks with one laptop power cord. 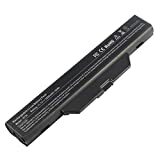 Compatibility: HP ENVY 15 17 TouchSmart Sleekbook M6 M7, Stream 11 13 14 Spectre x360, DV14 15 2000 4000 5000 6000 8000, Pavilion Dv4 Dv6 Dv7 Dm4 G6 G7, Folio EliteBook Probook etc/ Dell Inspiron 11Z-1121 1320 13Z-5323 14-3420 14Z-5423 15R-5520 15R-5537 14R 17R N5010 N7110, Studio 15 17, Xps Latitude Portege etc/ Lenovo Thinkpad Z60 T410 SL400 SL500 SL510, Ideapad yoga 2 pro 11 11s 13 etc/ Acer Chromebook 11 13 14 15 C720 C720P R11 C740 Cb3 Cb5, Aspire P3 S5 S7 E5-573G E1 ES1, Travelmate etc. 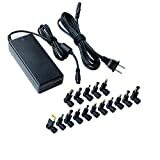 Package Content: 1 x Universal laptop charger 90w, 1 x 6 feet power cord, 1 x Connectors sets. 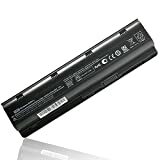 High-speed Charging, Multi Safety Protection, 99% compatibility for most brand laptop and ultrabook. Powerful Smart Voltage Current Management Technoloy, choose the right connector to connect your laptop, it will deliver a fitting Voltage for your laptop, easy and safe. At Belker, we believe in our products. We back them all with an 12-month warranty and provide friendly, easy-to-reach support. 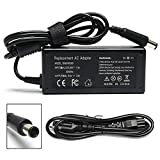 Please ensure the connector size and output voltage match your need before charging your laptop. Prohibit the use of overload. If not find the right connector for your laptop, please contact us. Our Service: Focus On Providing Quality Power Products and Excellent Customer Service,24 x 7 Email Support,12 Months warranty, 30 Days Money Back Guarantee!Buy with confidence! Product Type :Input: 100~240V~1A 50/60Hz Output: 18.5V-3.5A-65W. Ac Adapter Laptop Charger for HP Compaq Presario CQ40 CQ41 CQ42 CQ43 CQ45 CQ56 CQ57 CQ58 CQ60 CQ61 CQ62 CQ70 CQ71 cq50-139wm cq60-615dx cq57-339wm cq56-219wm cq70-419wm cq57-339wm cq60-615dx cq60-419wm cq60-417dx cq60-211dx cq60-427nr cq61-420us cq61-411wm cq61-313us cq61-410us cq62-238dx cq70-419wm Laptop Notebook PC Power Supply Cord Plug. Warranty:30 Days Money Back Guarantee/12 Months Warranty. Best customer service. Connector size : 7.4 mm×5.0 mm. 1.Please press [Ctrl + F] to serach your type. 2.If you are not sure,pls contact us by email,we would always be here. 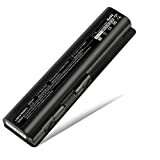 Battery Type: Li-ion Capacity: 4400Mah/47Wh; Cells: 6-cell; Voltage: 10.8V. 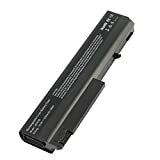 Compatible : HP Compaq Presario CQ32 CQ42 CQ43 CQ56 CQ57 CQ62 CQ72 Series CQ56-115DX CQ57-339WM CQ62-219WM CQ56-219WM CQ56-129NR CQ56-109WM CQ57-210US G62-340US G62-144DX G62-225DX G72-B66US G72-250US G72-259WM G7-2270US G7-1328DX Battery. 100% New from Manufacturer. Up to 500 recharge cycles over the life of the battery. CE-/FCC-Certified for safety. Warranty: 12 Months Warranty, 30 days money return guarantee. About TSKYBEAR: TSKYBEAR is committed to creat high quality products,we use good quality A + cells , it ensure fast charges and low power consumption. NOTE:Please check the original battery model, shape. Make sure you get the correct battery. 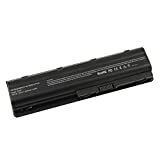 Laptop Battery for Hp Compaq Business Notebook NC6100 NC6200 NC6400 NX6000 NX6100 NX6110 NX6310 NX5100 NX6710. 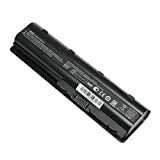 HP Compaq Business Notebook: 6910p, 6710b, 6715b, 6710s, 6515b, 6510b, NC6200, NX6120, NC6100, NC6220, NX6125, NC6230, NX6140, NC6400, NX6310, NX5100, NX6310/CT, 6715s, NX6100, NX6315, NC6105, NX6105, NX6320, NC6110, NX6110, NX6320/CT, NC6115, NX6110/CT, NX6325, NX6220, NC6120, NX6115, NX6330, NC6140, NC6200, NX6300, NX6000, NX6710. HP:360482-001, 360483-001, 360484-001, 364602-001, 365750-001, 367457-001, 372772-001, 382553-001, 383220-001, 385843-001, 385895-001, 393549-001, 393652-001, 395790-001, 395791-001, 396751-001, 397809-001, 398650-001, 398680-001, 398854-001, 398874-001, 408545-001, 409357-001, 415306-001, 418867-001, 418871-001, 443884-001, 443885-001, 446398-001, 446399-001, 983C2280F, DAK100520-01F200L, EQ441AV, HSTNN-DB05, HSTNN-DB16, HSTNN-DB28, HSTNN-FB05, HSTNN-FB18, HSTNN-IB05, HSTNN-IB08, HSTNN-IB16, HSTNN-IB18, HSTNN-IB28, HSTNN-LB05, HSTNN-LB08, HSTNN-MB05, HSTNN-UB05, HSTNN-UB18, HSTNN-XB11, HSTNN-XB18, HSTNN-XB28, PB994, PB994A, PB994ET, PQ457AV. Tips: You can use "Ctrl+F" to find your own model or part number. The Advantage: 11+ years design and production experience in replacement laptop charger. Quality you can count on.